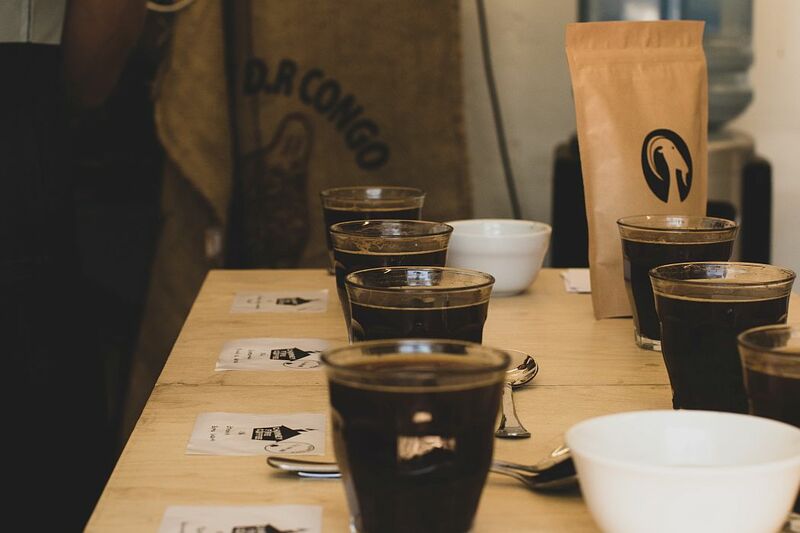 Yep, as the title suggests, stolen goat will be launching has just launched a coffee collection. It’s no surprise really…. 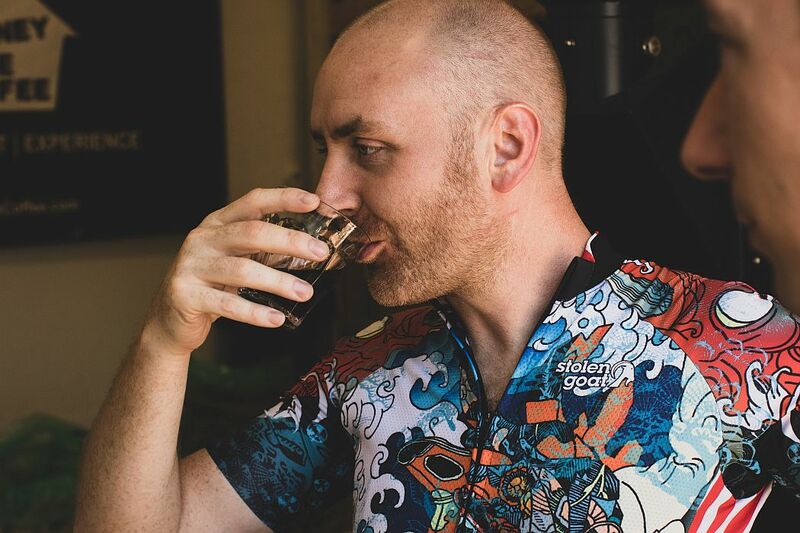 cyclists and coffee go hand in hand like jam in doughnuts and French in fries? Maybe the last one wasn’t the best analogy but I’m hungry, anyway, we digress. 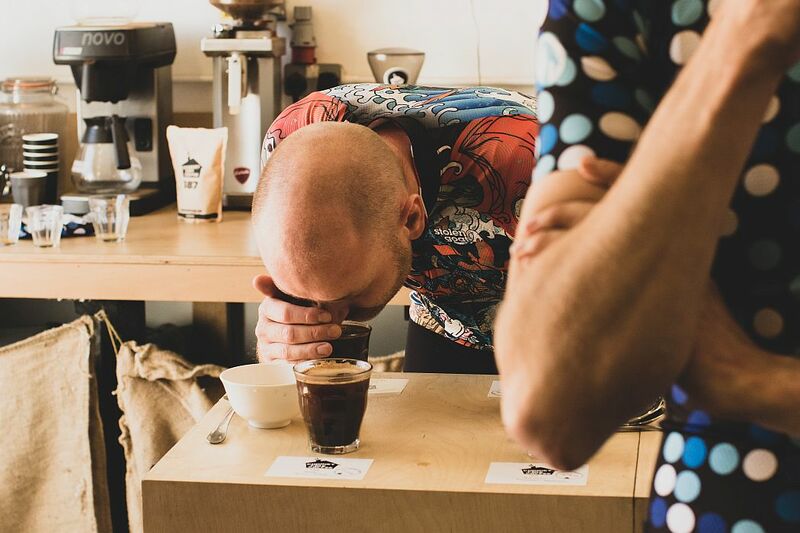 Everyone at SG HQ loves a good coffee and we know fellow cyclists do too, everyone does…. 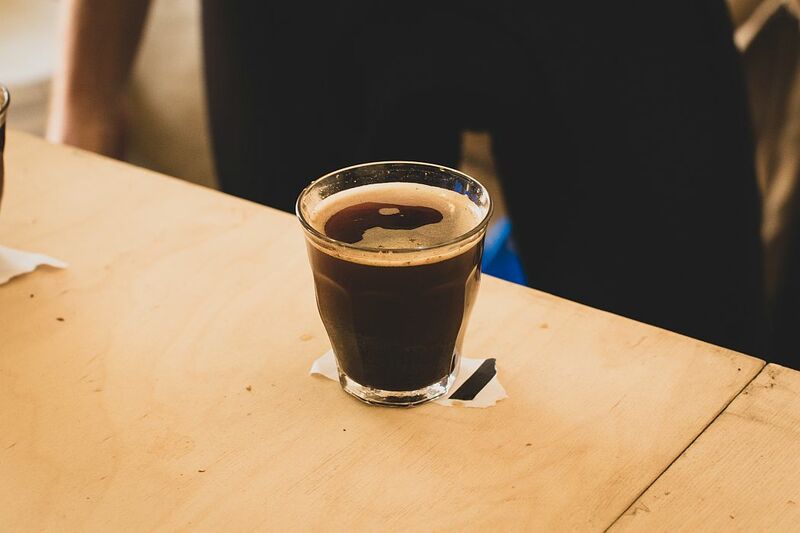 One afternoon, after running out of coffee, someone blurted out….. ”Hey! why don’t we make our own coffee?”. 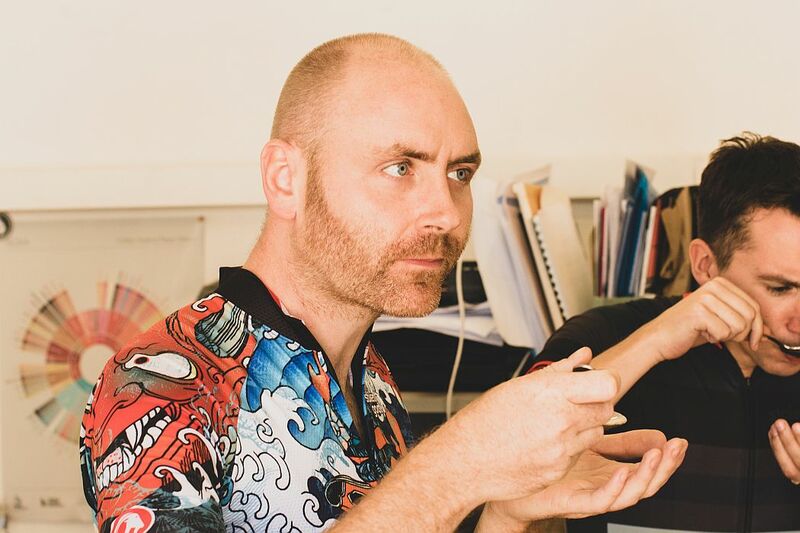 The office went quiet….. you could see everyone contemplating the concept……. ”That’s a great idea! We could learn how to make it, plus…. and a big plus at that, we can drink as much coffee as we like”. 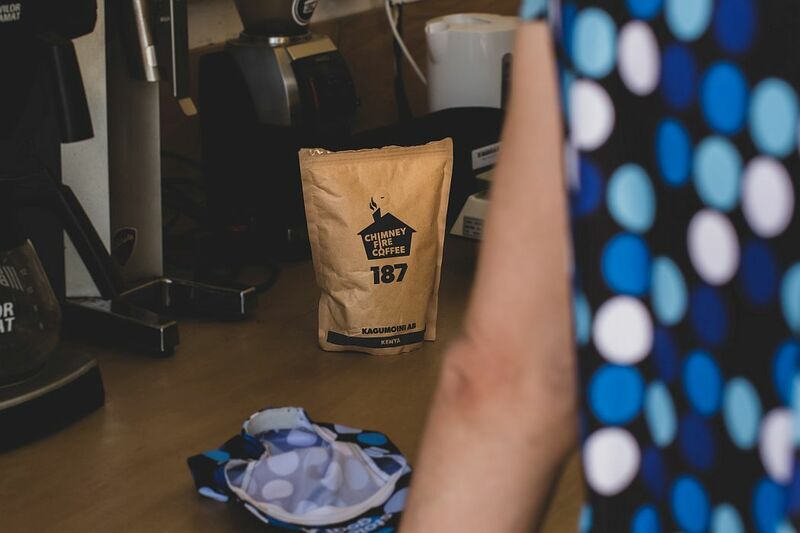 There was no downside…..
For the next several weeks there were many different coffees being brought into the office. 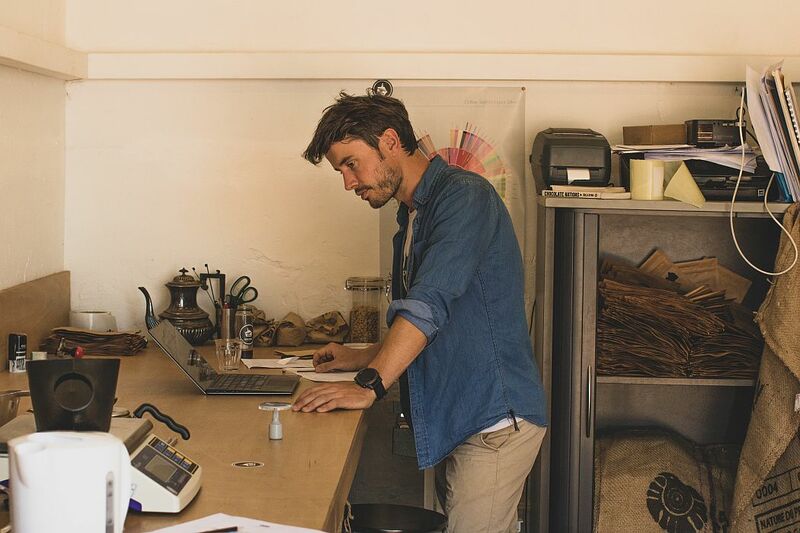 It was all well and good but it very quickly dawned on us that we hadn’t any contacts or experience in the coffee industry and didn’t know where to begin. There were so many questions, questions on questions. How were we going to source the coffee beans and even if we do…. how would we process/ manufacture them for resale…….? 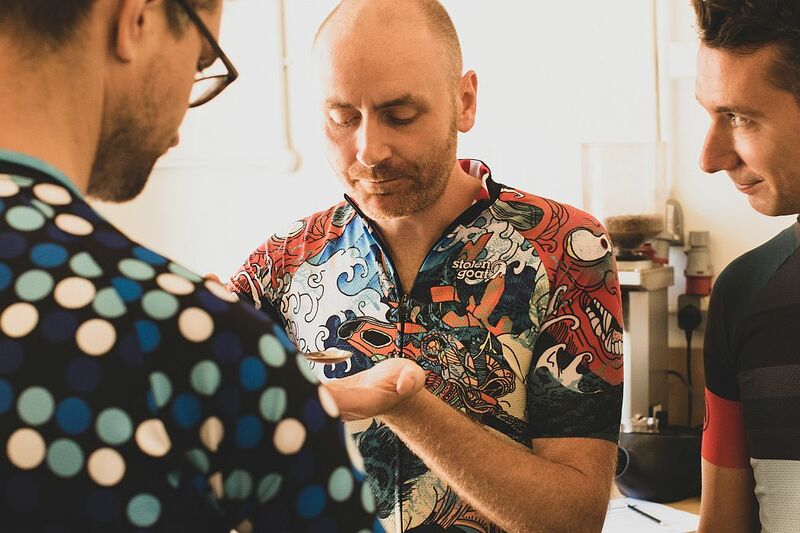 Etc…..
We needed an expert, someone who had been on the epic journey in search of the best beans, who had the machines, the knowledge and the know-how to complete the mammoth task. Without this, our idea was dead in the water……. It wasn’t looking great…. the more we looked into the idea the further away the finish line appeared. A few days passed and we were almost ready to move on from the unrealistic coffee idea but over that weekend, Andy had been at the Ripley Farmers’ Market and it just so happened (in his usual, typical amazing, super friendly way) he got talking to Daniel (the owner of Chimney Fire Coffee) who coincidentally sources roasts and produces his own coffee…….. It was like it was meant to be!……… Could Dan be the saviour of our coffee idea? 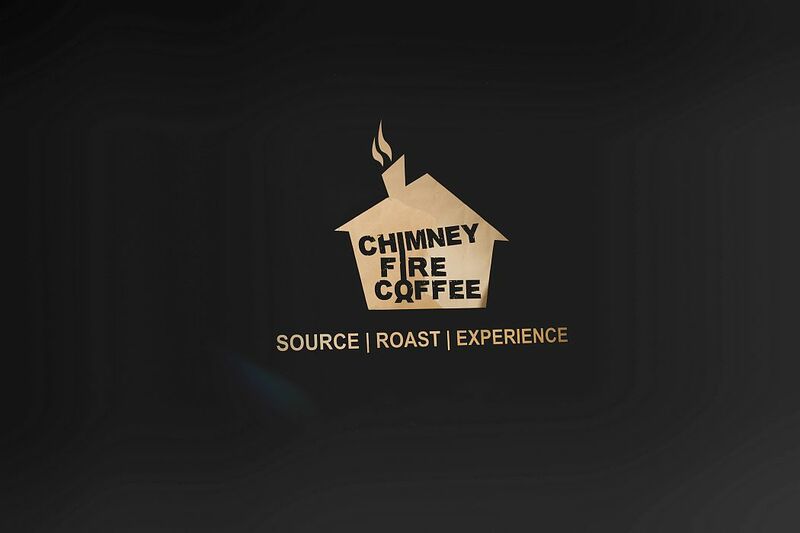 Introductions were made, emails were exchanged and It was clear from the start that we’d have a great partnership with Dan and Chimney Fire Coffee. 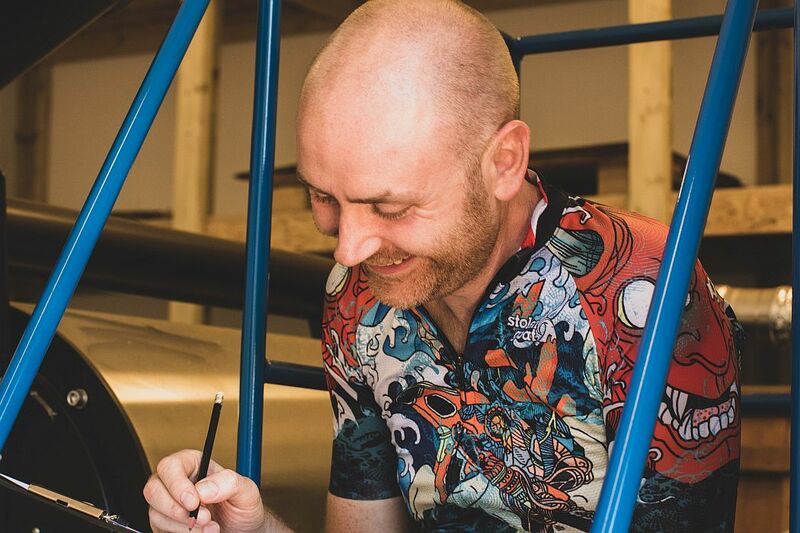 Dan is super friendly, willing to help, has a similar ”adventure more” mentality and is passionate about what he does. He completed a masters in Sustainable Development and from there spent several years working in ethical and traceable coffee and cocoa sourcing in Ghana which is where he gained the experience in various farming practices, quality processes and handling of certified coffee as well as working with producers to identify high-grade speciality coffee with unique flavour profiles. 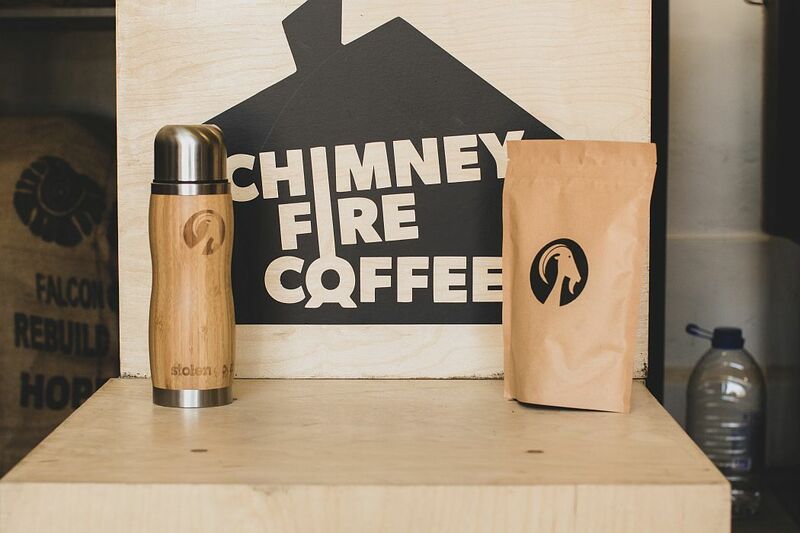 In the background Dan continued home-roasting and completed SCAE sensory courses before launching Chimney Fire Coffee in 2016 and basing himself in the SURREY HILLS! What a story! For us, It doesn’t get more fitting than that. 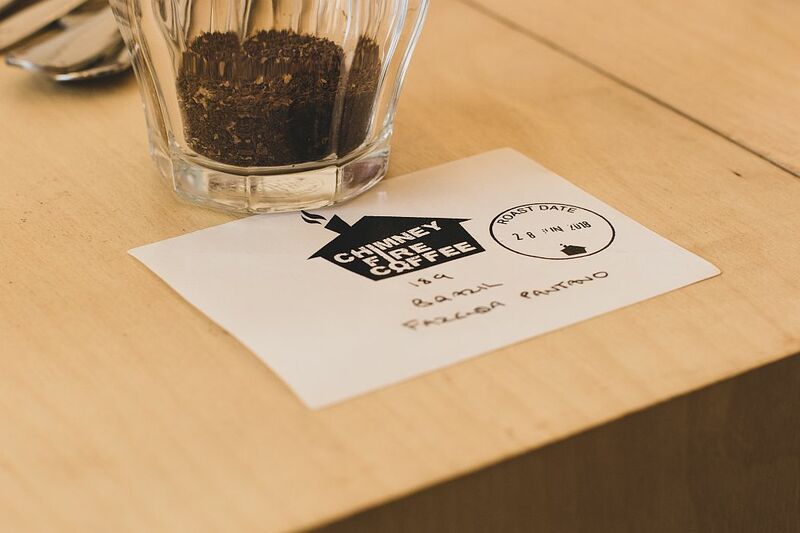 Over the next few days, several different Chimney Fire Coffees were tried in the office and the coffee was sublime, rich and full of flavour. We were all blown away. 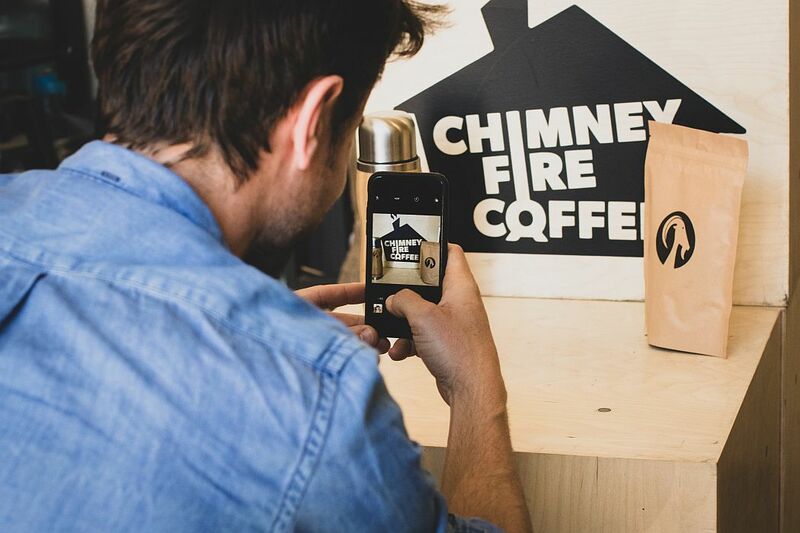 Dan invited us to Chimney Fire HQ for a taste experience (coffee cupping) and, hopefully, we’d leave with our very own coffee blend. We were pumped, the day couldn’t come soon enough…… We were going to make our own coffee!!!! Finally it was the day we’d all been waiting for. 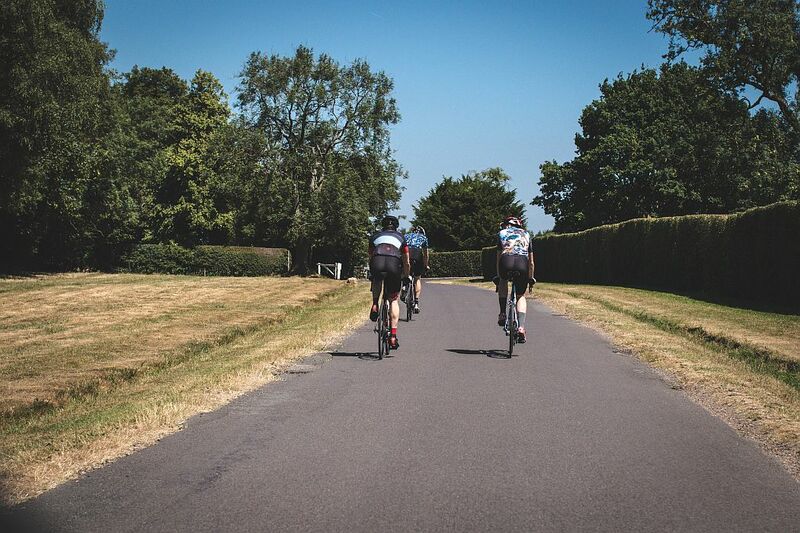 Given Chimney Fire’s fabulous location at the top of Ranmore in the Surrey Hills, we decided to make a proper day of it and cycle. The route was great, country roads, great climbs and descents and the weather was beautiful! The ride itself was only an hour long but thanks to Andy’s lack of concentration we rode some less frequented roads on the way over and remembered how much we liked them! Eventually, checking with Garmin we managed to arrive at a stunning manor house and a little further along a group of converted barns where our host was waiting for us. 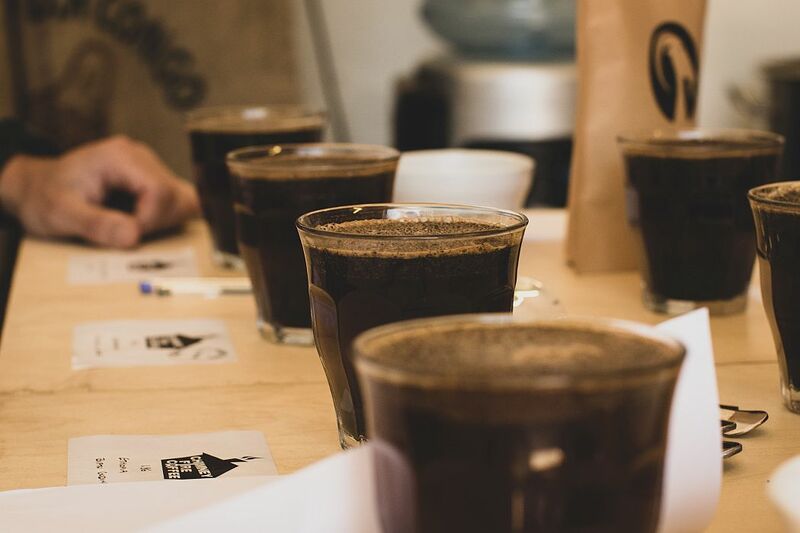 The dry aroma was first on the agenda, 7 cups in total, each filled with a different origin of coffee bean or blend. 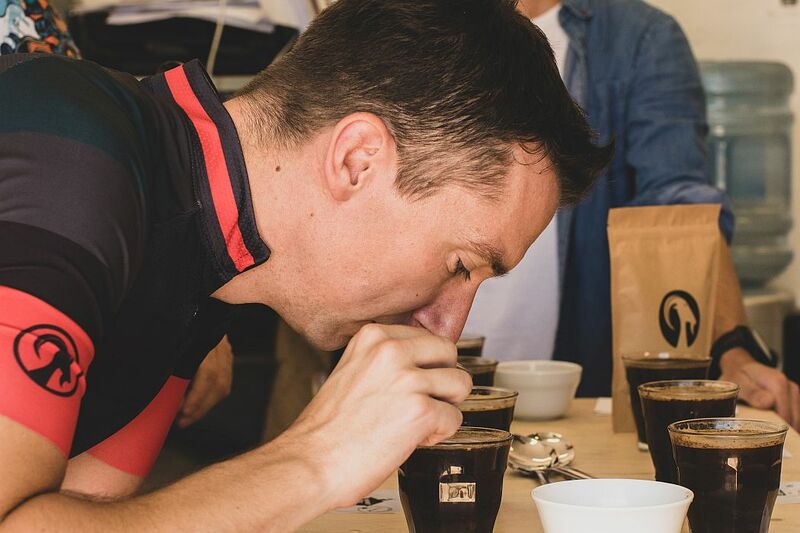 Our job was to smell each of the cups and determine our favourites. 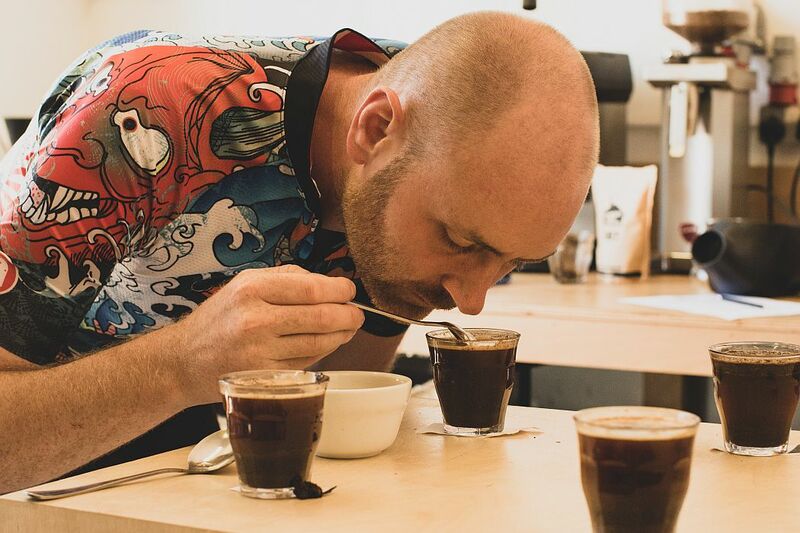 It turns out that to get a proper whiff of the coffee there’s a certain technique called cupping, kind of like wine tasting but for coffee…. I WONDER WHAT HE’S THINKING? After the dry aroma, water (at just the right temperature) was poured into each of the cups and left to brew for about 5 minutes. 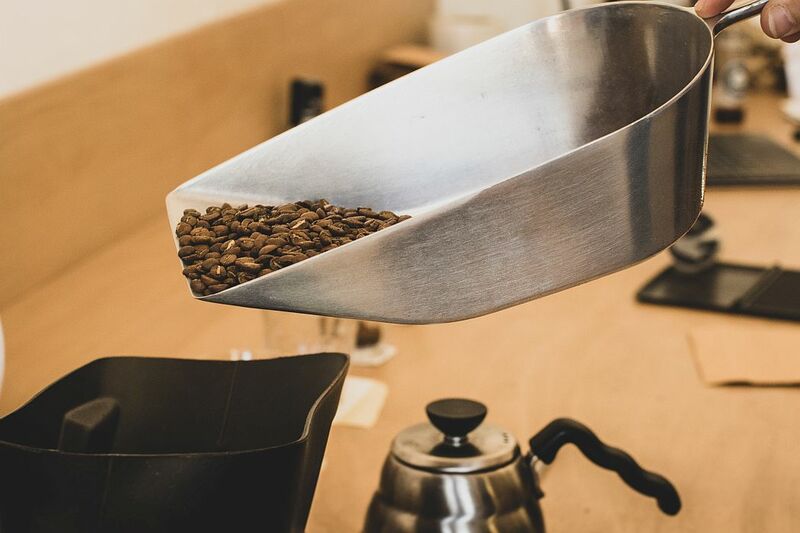 Eventually, the granules rose to the top and created a crust which we then broke by brushing it with the back of our spoons to release the pure wet aroma of the bean. The smell was ever so slightly different now the granules were wet. 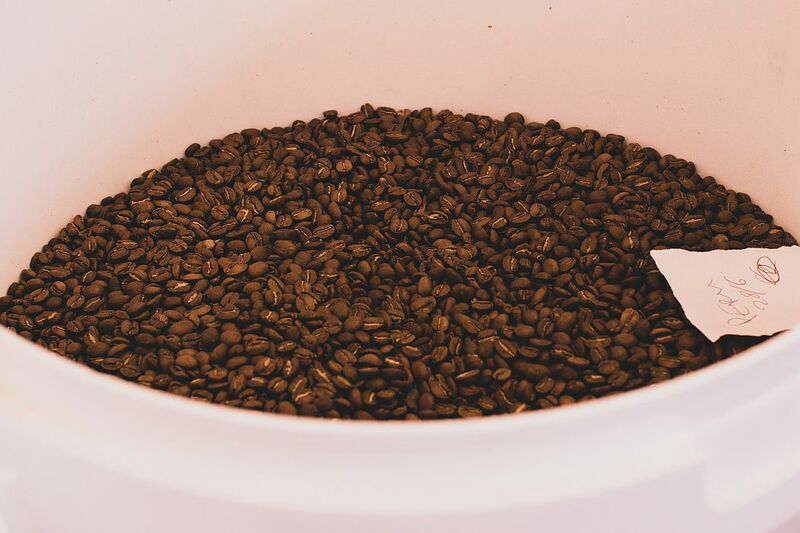 Brewing released even more from the coffee, giving an explosion of new flavours and smells. 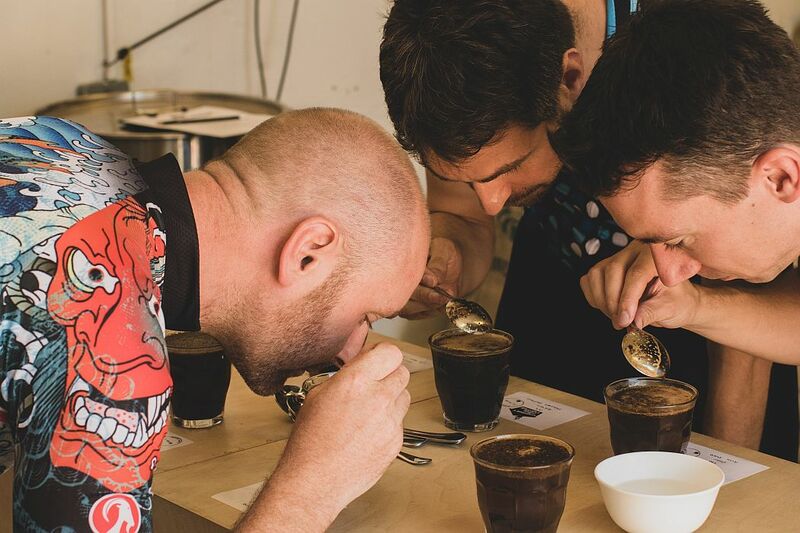 We loved all of them but chose our favourites and got to smelling in earnest, but I couldn’t help but notice that everyone was just itching to actually start tasting (drinking) this delicious coffee. Once we had gone through and noted our favourites, Dan showed us the next stage. He expertly removed the crust from the coffee, ready for us to taste. 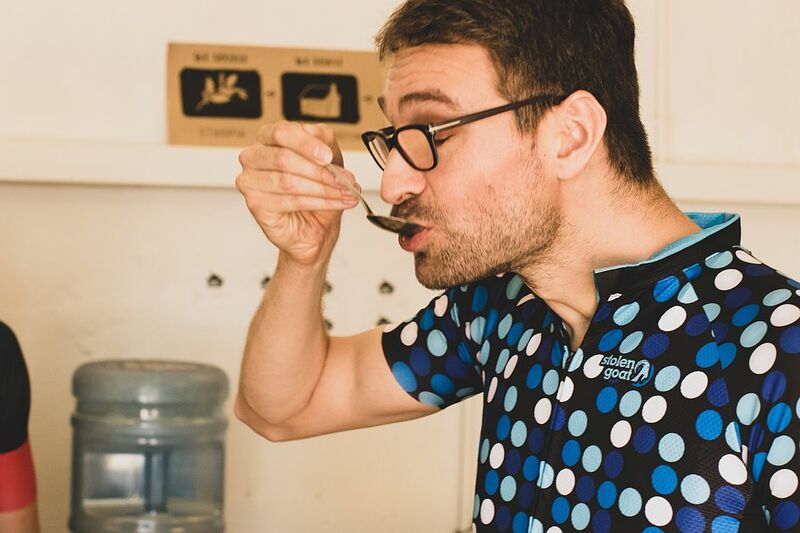 Again, very much like wine tasting, there’s a certain way you go about tasting coffee. 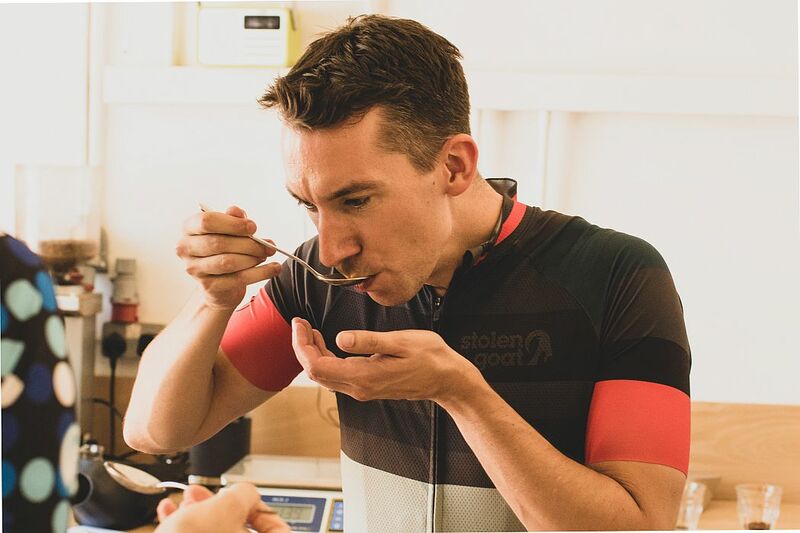 The technique is fairly simple: Get a tablespoon of coffee and slurp it as loud as you can…….. easy! 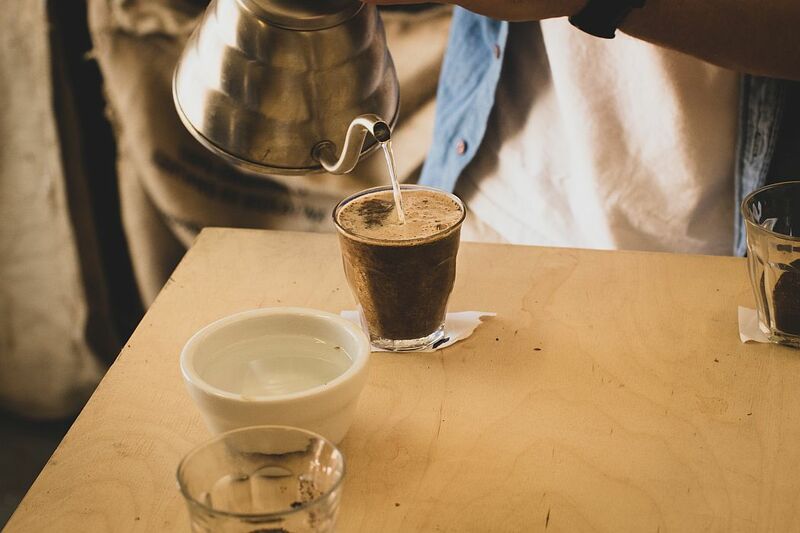 By doing this the coffee infuses with air which basically gives a stronger flavour. Once everyone had ”tried” all of the flavours….. some multiple times wink, wink…. we put our heads together to decide our favourites. 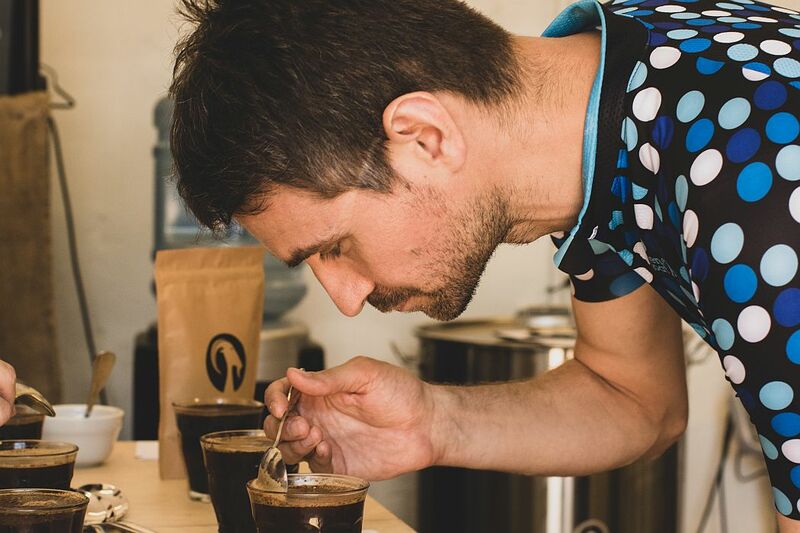 We quickly realised that there were a couple of clear favourites within the team and Dan cleverly listened to our thoughts and suggested a couple of blends he thought might create our ideal coffee. 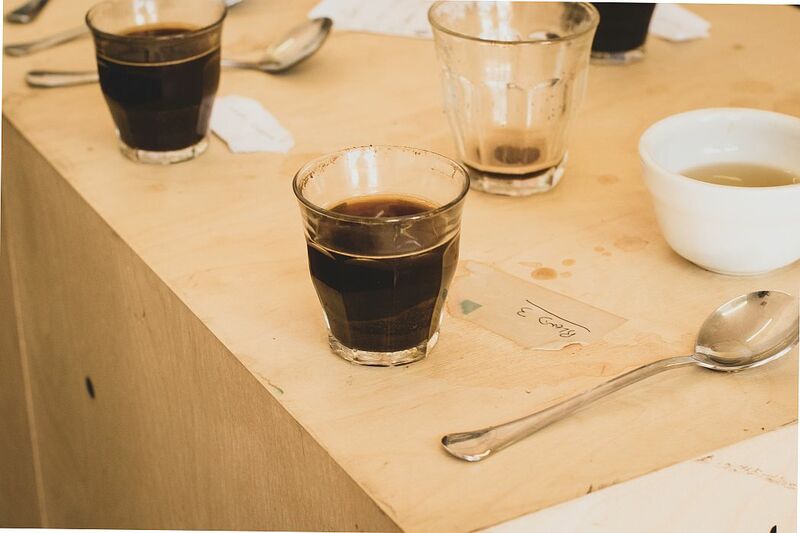 He got to work and within no time at all he had setup the tasting table again but this time hiding the coffee names and blends that he had prepared. The blind smell and taste test was designed to find our favourites without the influence of the cards. 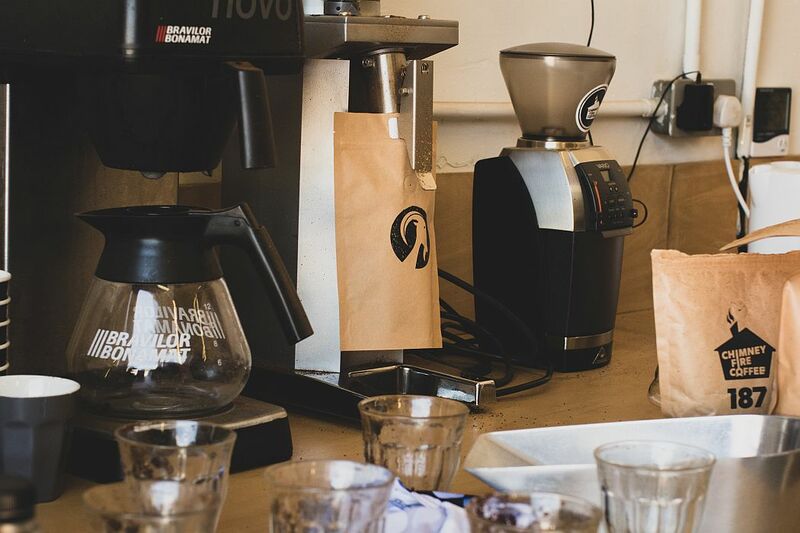 Surprisingly, even as non-experts, the results were slightly but noticeably different and the new blends that Dan created for us, were simply bliss. After a brief discussion, we all agreed that with some subtle adjustments we had found our ideal flavours! We were the proud owners of not one but two coffee blends!!! We had done it! 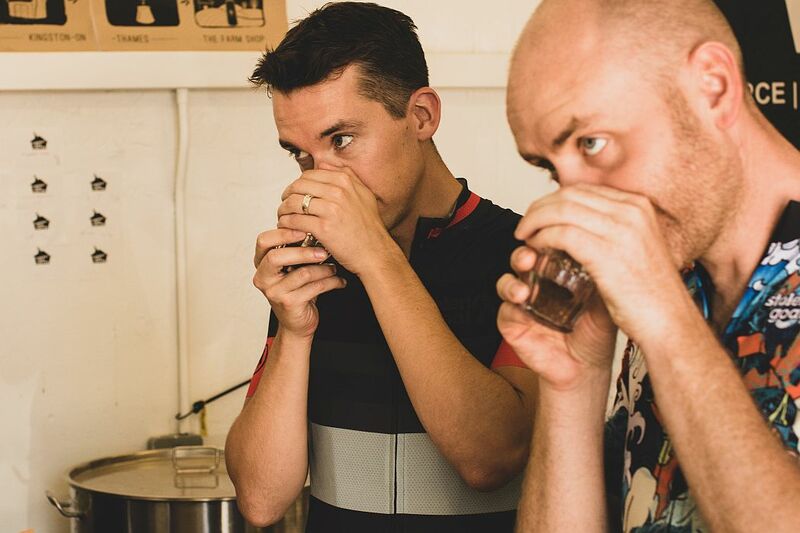 We had created our own blends of coffee and, of course, we couldn’t have done it without the help of Dan. His knowledge and ability to listen and make the changes we wanted was very impressive and I’m sure it takes a great deal of time and practice to gain that level of skill. 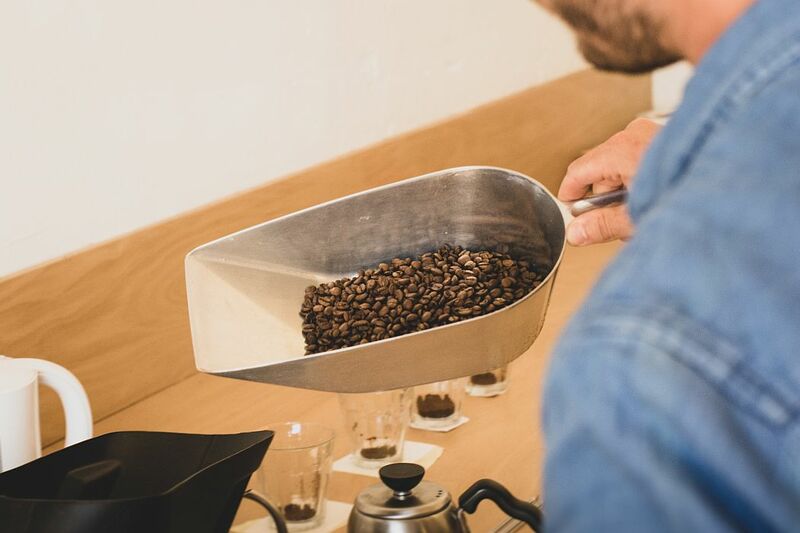 We saw that coffee is a complicated thing, even tiny changes making big differences in flavour: everything from how the coffee bean is grown and stored to roasting temperature and roasting duration. 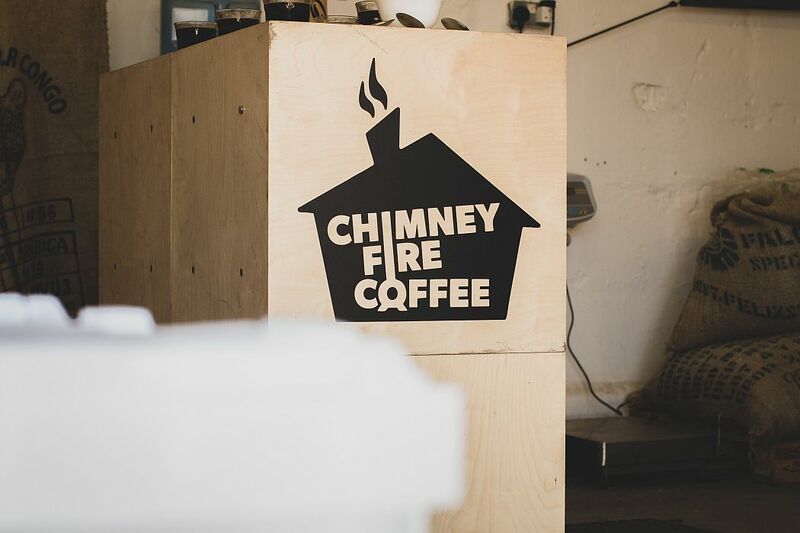 It would have taken us years to achieve on our own so thank you Dan and Thank you Chimney Fire Coffee! We wanted our packing to look minimal and rustic – a natural feel. 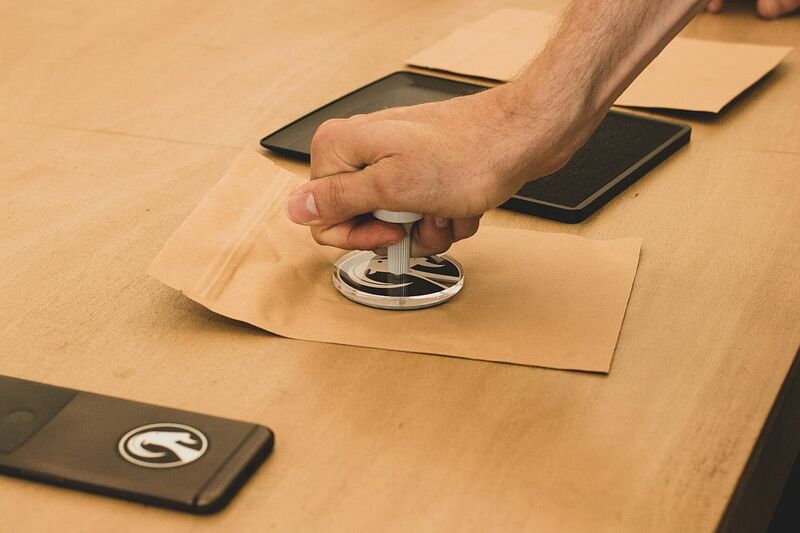 We opted for the biodegradable brown bags with a resealable zipper and small one-way valve which keeps oxygen out to maintain freshness, but allows the coffee to degas (carbon dioxide is naturally released). 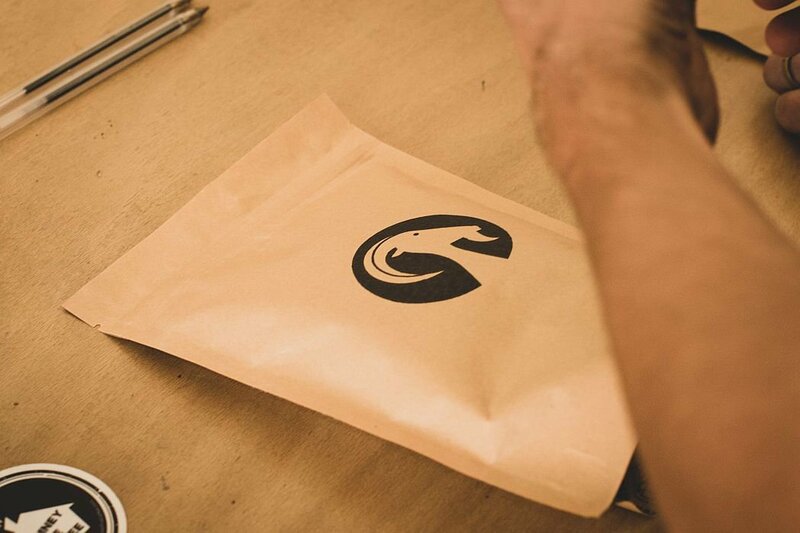 As to the design, we will have our goats head logo and also the coffee blend number stamped on the front. 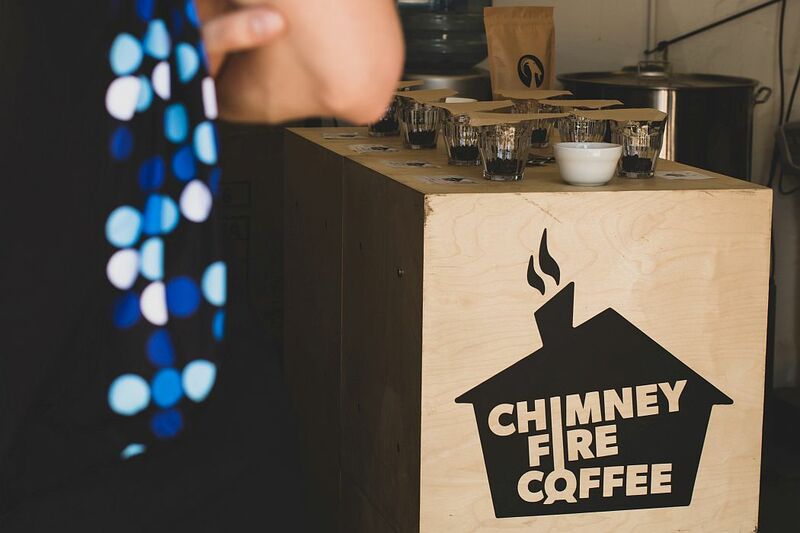 If you fancy the coffee tasting experience for yourself make sure you contact Dan at Chimney Fire Coffee! It’s great fun and an incredible experience! 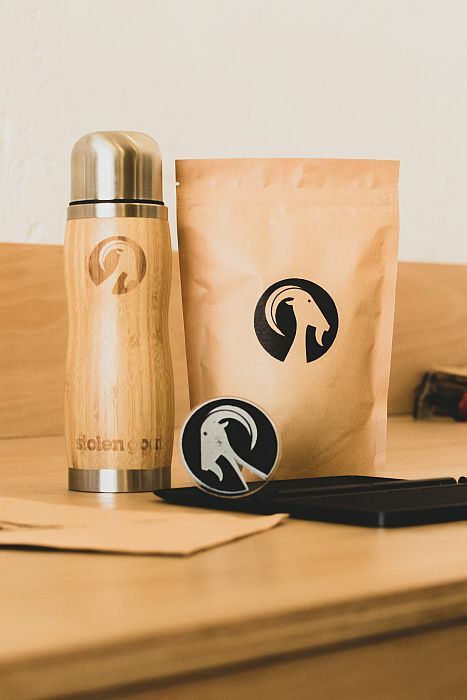 This entry was posted in Goat News, Product Tech & Reviews and tagged 2018, adventure more, bemoregoat, best sellers, blog, coffee, coffee bean, coffee lovers, cycling gifts, events, facebook, fun, gifts, goat, inspiration, instagram, make your own coffee, motivation, news, products, review, small business, social media, spotlight, Stolen Goat, stolen goat coffee.